Great Runs is the ultimate guide to the best running routes in the world’s major cities and destinations, and we’re excited to share these destinations with Runkeeper users from across the globe. Right now, we’re thinking about summer, and the millions of people who will be traveling to Europe’s three most visited destinations: London, Paris, and Rome. These cities are all great for running, with iconic routes located close to major attractions and popular hotels. For each city, we’ve chosen our top 3-4 running spots, generally featuring a route along the water, a fantastic urban park, and some sort of “runseeing tour” to take in major sites. One more item worth mentioning is that most European cities have excellent public transport, making it possible to access great running spots without a car. You could even do a long one-way run and take the subway back! London is one of the world’s great cities, and it’s also fantastic for running. With its grand parks, paths along the River Thames, and historic sites, so much of what’s interesting to see is accessible on foot. 7.7 mile loop. Start: Westminster Bridge. A nearly 8-mile runseeing tour. See Big Ben, the London Eye, St. James, National Gallery, Piccadilly, Trafalgar Square, Primrose Hill, and Regent’s Park—all in one run! 7.2 miles, RT. Start: Hyde Park. This run incorporates London’s famous inner city Royal parks: Kensington Gardens, Hyde Park, Green Park, and St. James Park. It is a way-marked ‘figure eight” loop, in honor of the late Princess Diana. Add to the route by enjoying some of the trails within the parks. 4.0 miles one-way. Start: Tower Bridge. Running along the Thames River embankment, 4 miles between Tower Bridge and Vauxhall Bridge, is one of the running/tourist treats of London. 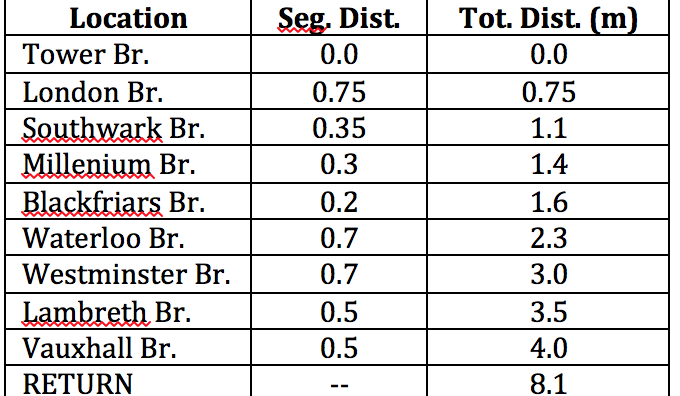 The main bridges of central London are fairly close together, so it’s easy to do loops of various lengths—see our table for segment distance between the bridges. Major sites include: Tower Bridge, City Hall, London Bridge, The Tate Modern, Millennium Bridge, The National Theater, the London Eye, and Big Ben. A wonderful and hilly running area in the affluent Hampstead residential area, accessible by Tube. The historic heath is a great collection of views and landscapes, part open and part wooded. Great for hill training. Our map has three distance options. History, architecture, museums, food, culture, beauty, and walkability make Paris one of the world’s most popular travel destinations. The running scene there has been improving, with greater attention to paths and spots away from cars. 7.5 miles. Start: Pont Neuf or any spot. A 7.5-mile “highlights of Paris” tour, which includes The Louvre, Eiffel Tower, Champs Elysées, and the city’s famous parks and gardens, all in one run. 7.3 miles, options for longer/shorter. Start: Notre Dame, or other spot. Not just your ordinary river run. This is one of the great urban runs of the world. Several sections have been turned into below-road pedestrian-only paths, with great views of Paris’ wonderful buildings and landmarks. Our route goes out one side and back on the other. This is the loveliest, shadiest place for running in the heart of Paris, and is one of the great urban parks. You’ll find hundreds of fellow joggers on a nice evening, enjoying the 35 miles of trails in the park. See our full description and Park Map for the many route options. One of the world’s great cities to visit, Rome is filled with antiquities, wonderful historic sites, lovely old neighborhoods and great restaurants. Yes, it can be hot and crowded, but there are great places to run within proximity to where most travelers stay. Highlights of Rome running include a nearly 9-mile “Rome Sights” tour; paths along the Tiber River, and Rome’s three largest parks—Borghese, Ada, and Pamphili. 8.6 mile tour. Start: St. Peter’s Square or any point. This is a tour of some of Rome’s principal sights, so do it early to beat the crowds and the heat! Run by St. Peter’s Square, Castel St. Angelo, Spanish Steps and the Piazza de Spagna, Trevi Fountain, Piazza Venezia, Piazza St. Marco. Skirt the Capitoline and the Roman Forum by running along Via dei Fori Imperiali to do a tour of the Coloseum, and then through the Circus Maximus. Up to 7 miles one-way. Start: St. Peter’s or any point. A bike path runs along the river for nearly 7 miles from Olympic Stadium to Ponte Guglielmo Marconi, below the roads in some sections. A great way to see the city without dealing with traffic and intersections. Start with a lap around the track of Olympic Stadium, location of the 1960 Games. There are three great parks for running in Rome. 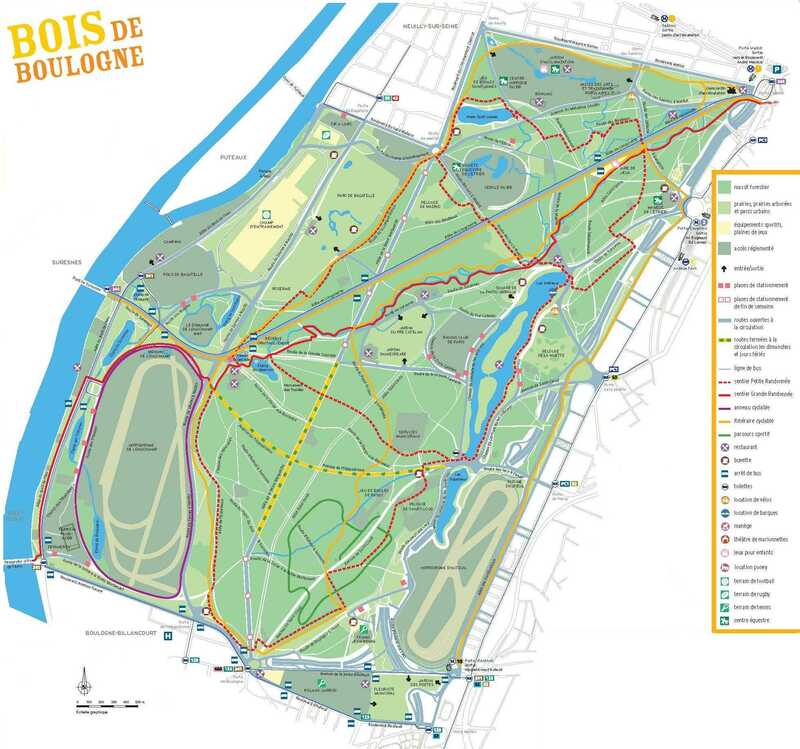 Villa Borghese is centrally located and has around 3 miles of grand allées for running. Combine this with nearby Villa Ada, which is more wooded and less manicured, with numerous paths. The most stunning is Villa Doria Pamphili, Rome’s largest park, which contains a stunning, mid-17th century palace surrounded by garden mazes, jogging trails, fountains, a superb grotto, and pine-lined views of Rome from atop the Janiculum hill. Full profiles of London, Paris, Rome, and 20 other European cities can be found at Great Runs. You can also follow along for more great runs on Twitter, Instagram, or email mark.lowenstein@greatruns.com with your own route suggestions.